FiftyTwo 2.00: Bigger and better! 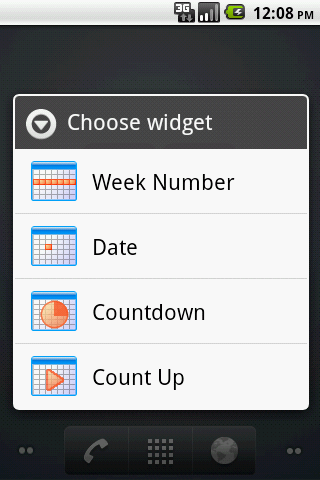 We’re really pleased to present a major update to our Week Number widget for Android. It’s better than ever now, giving you a whole collection of date widgets, including: date, week number, countdown (days until) and count-up (days since). It’s also bigger than ever! Until recently, it was 64×64 “display pixels”, and now it is 74×74 display pixels. That results in a bigger, clearer display which fills its home screen square much better than before. Here’s an example of a home screen with all four FiftyTwo widgets. The colours of each widget are fully customisable of course. 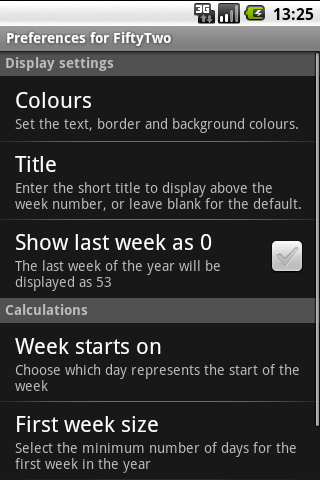 The screenshot was taken on 10th September, as you can see on the date widget. 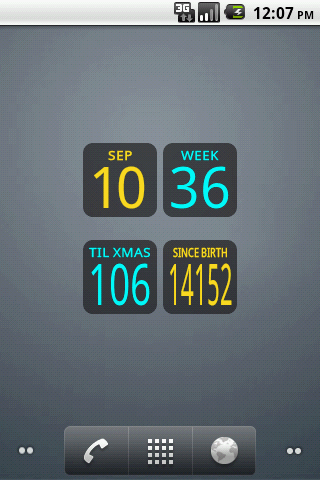 There is a countdown widget which is counting down days until Christmas 2010, and a count-up widget which is counting the days since I was born (12 December 1971). On the right, is the special FiftyTwo widget menu which appears when you select “FiftyTwo” from the normal Android widget menu. This gives you the further choice of all four types of widget that FiftyTwo provides. When you tap on a FiftyTwo widget, the overview screen appears (below left). This tells you what kind of widget you just tapped, and what it does. There are buttons to set the options and to customise the display settings. There’s a new feature which allows you to copy the display settings from this widget to all the others, which is ideal if you have several FiftyTwo widgets on your home screen and like to keep their appearance fresh and new, especially if you change your wallpaper often. If you launch FiftyTwo directly from the applications tray, the overview screen (below left) looks a little different. 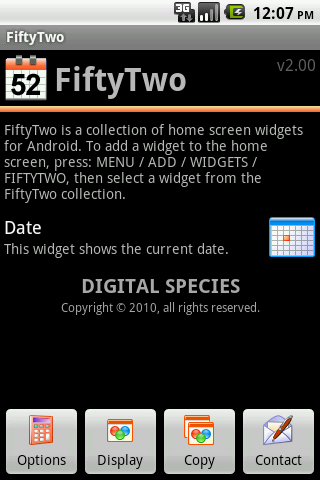 There’s a scrolling list of all the different kinds of widgets that FiftyTwo supports. There’s also an Options screen for all widgets, which lets you tell FiftyTwo if your phone is a little slow or low on memory. If you check that box, the widgets will be drawn on the home screen in a different way that works more reliably on some older phones. We hope you enjoy using FiftyTwo on your Android phone, and look forward to your feedback. If you use the custom ROMs supplied by Cyanogen, and just upgraded to 5.0.8, you may have noticed that the FiftyTwo widget isn’t working properly. There is a bug in this otherwise outstanding ROM, which is randomly garbling some screen output in various applications, including Console and RoboDefense. Hopefully this will be fixed in the next ROM update. If you’d like to let Cyanogen know that you’re having this problem on your phone, so that he can determine how urgently it needs to be fixed, please click the star on the bug tracking page. In this new release, there are two significant improvements. The first is much better kerning of the week number digits, removing excessive spacing when the number ends in ’1′, and adding a little extra spacing when it ends in ’4′. The second improvement is a fix for an obscure bug which affects phones that are low on memory. When the widget is added to the home screen, or when the phone is rebooted, Android can kill the drawing process before it’s finished, leaving an invisible widget. Now, FiftyTwo will keep trying to draw the widget until it succeeds. 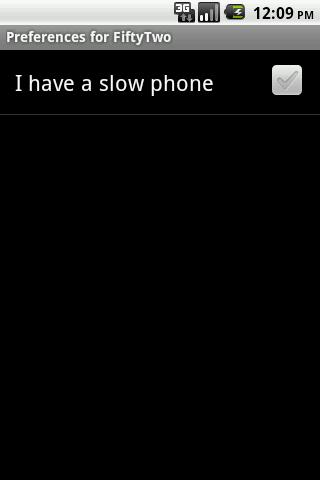 On an older phone with very low resources, this could take 20 seconds or more, but it will get there eventually. A minor release of FiftyTwo is now on the Market. If you change the phone’s time or timezone, the widget will now update immediately. 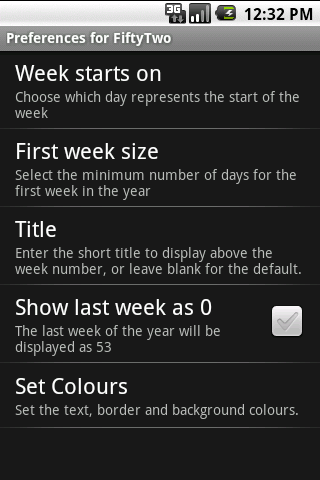 If you’re using Android 2.0 or greater, then the default title message (“WEEK”) will automatically update when the phone’s default language is changed. There have been some minor changes to the colour picker interface. FiftyTwo version 1.11 is now available. This includes new languages and two bug fixes. One fix relates to whether to display week 0 or 53. The second fix ensures that the title will change when the locale is changed… for the supported languages, at least. If you find any new bugs, or have a request for new features, please email us at android@digitalspecies.com. And if you like the widget, please rate it in the market! 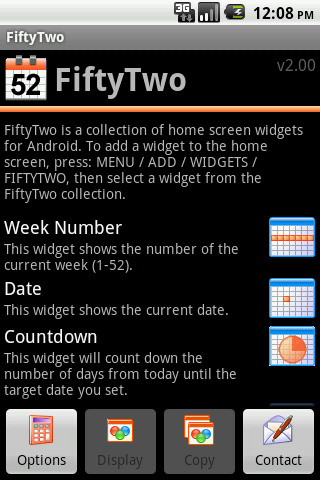 We just released version 1.10 of the FiftyTwo week number widget. For those people who want to use this widget to track the financial year of their company or country, you can now specify the date when the year starts. 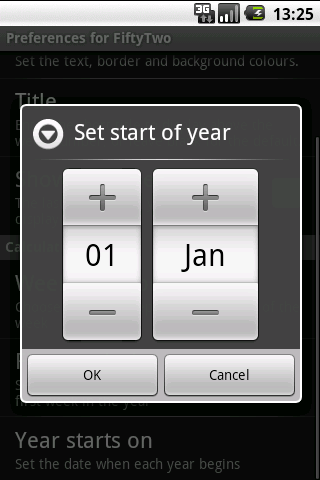 By default this is 01 January, but it can now be changed to any date you desire (apart from 29 February). We also took the opportunity to reorganise the Preferences screen a little bit. Finally, several annoying bugs were fixed, especially one which caused force-close issues on some phones. A new version of FiftyTwo is now available on the Android Market. 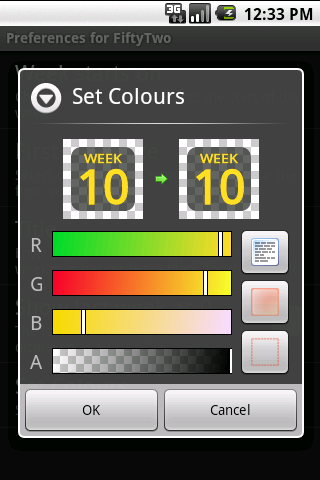 By popular request, we added an RGB colour picker, so you can easily change the colours of your widget. The screenshot just below here shows what it looks like. You can see the widget in “before” and “after” images at the top. The text, border and background colours can all be edited separately, by touching the buttons on the right side and using the colour sliders (red, green, blue and transparent). There are also a couple of new options. It’s now possible to edit the short title message above the number. This shows “WEEK” by default, but can now be changed. Usually, the last half-week of the year is given the number “53″, but you can now specify that it should be week number “0″ instead. The Preferences screen has been re-jigged to fit in all the new features. FiftyTwo is now using a completely rewritten algorithm to calculate the week number, which has resolved a few annoying bugs. If you find any new bugs, or have a request for new features, please email us at android@digitalspecies.com.